Irvine, California - Pasternack, a leading provider of RF, microwave and millimeter wave products, has released 18 new 4.3-10 connectors and adapters with maximum operating frequency of 6 GHz and VSWR as low as 1.08:1. Typical applications include custom cable assemblies, feeder cables, mobile communications systems, base stations, distributed antenna systems (DAS) and small cells. 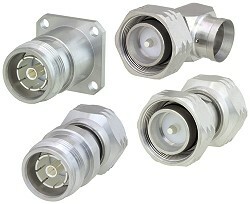 Pasternack's new 4.3-10 connectors and adapters feature low coupling torque and low-PIM performance of -166 dBc typical. An IP67 rating ensures that, when mated, they are protected from dust and temporary moisture under immersion. These connectors and adapters are made with silver-plated center contacts and a corrosion-resistant tri-metal finish on the body and outer conductors. They have an IEC 61169-54 compliant interface and boast 30 percent reduction in footprint when compared to 7/16 DIN. "The combination of low-PIM performance, weather resistance and corrosion resistance makes our 4.3-10 connectors and adapters' ideal for DAS and other mobile communications systems infrastructure," said Dan Birch, Product Manager at Pasternack.